As an island, Bali is "surrounded" by 100s of kilometres of beaches: snow white, creamy, grey, and black. So it should not be difficult to find the right beach location: True for Bali Rainbow Wedding it is easy because "we've been there and have done that" = We inspected the beaches and – if regarded perfect for the couple - had beautiful weddings and celebrations there. And we keep looking for spots that nobody has located yet to add it to our small but exclusive portfolio. Beach wedding venues can be completely secluded, or part of a resort, or a private beach of a stunning villa. What we will find out with you as our couple is what you have in mind when you think of a beach wedding, and what preferences you may have. We will then recommend a variety of locations that we have used for our beach ceremonies before - or will look further if you are not satisfied with our location ideas. 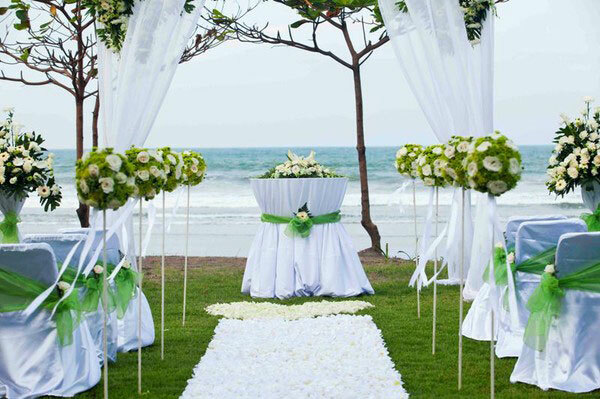 Below are some photo examples of beach wedding decorations that we would like suggest. Your personal wedding decoration can look exactly the same as the samples; but we can also change, extend, or minimize them. Or we suggest and develop together with you completely new wedding decorations that are much more "you".